The conjunctiva is the pink tissue that lines the inner surface of the eyelids and covers the white portion of the eyeball (sclera). It is a protective layer that contains special glands that secrete a component of the tear film that helps maintain normal eye health. Conjunctivitis is a condition where the conjunctiva becomes reddened, congested, and painful. It may occur in one or both eyes, depending upon the cause. 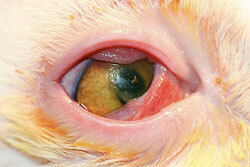 Causes of conjunctivitis include foreign matter, chemicals, bacteria, viruses, and environmental irritants like smoke. Other causes may be due to systemic diseases or allergic reactions. Conjunctivitis may lead to, or be a sign of, corneal ulcers (abrasions of the cornea), eye infections, corneal scarring, corneal vascularization, corneal mineralization, corneal sequestrum (primarily in cats), conjunctival adhesions, nasolacrimal blockage (blockage of normal tear flow), and keratoconjunctivitis sicca (dry eye). 1.Laboratory tests, including blood tests, conjunctival scrapings and cultures may be needed to help determine the cause and an effective treatment, if there is no readily apparent cause on examination. 2.Attempts should be made to prevent further irritation to your pet’s eyes from such things as contaminated water, soap, dust, sprays, smoke, (self-) trauma, etc. 3.The medical treatment for conjunctivitis may involve life-long or intermittent use of topical and/or oral medications depending on the underlying cause. Treatment is designed to stop progression and recurrence of the disease process and to reverse some of the damage already done. Life-long topical medications rarely give rise to complications. Your doctor will discuss any relevant potential side-effects of prescribed treatments with you.